Usually when I do these antique Victorian furniture posts I post an image or so and accompany it with the brief research that I have done. I’m going to do it backwards this time. I am posting the image first without having done any research and let those in the Rare Victorian community who are fans of Herter Brothers and the Aesthetic Movement sniff around in parallel with me and contribute their thoughts via the comments section below. I receive emails regularly from site visitors wondering what furniture they have and which Victorian-era cabinetmaker produced it. The chair above is part of a 3-piece Aesthetic Movement parlor set that was passed down in the family from a visitor’s grandparents who purchased it around 1911 when they married. Along with it came the story passed down by grandma that it was designed by the famous architect Stanford White. She also suggests by the floral design on the skirt that it could have been made by the Herter Brothers. So what are your thoughts? Could it have been designed by Stanford White? Might the set have been manufactured by the Herter Brothers? I only have time for this brief thought right now: if we accept at face value that the furniture was both purchased in 1911 and designed by Stanford White, then it would have been a “used” furniture purchase. In 1911, Stanny White was long dead, having been murdered in 1906. It would be a lovely set with proper upholstery. Only an architect could have designed that,…will keep the rest of the comment to myself. Quickly, I also agree with ‘misslilybart,’ that chair is pre- 1911. Good luck you super sleuths’! Herter Bros – who knows? Haste makes waste… the date on the suite is circa 1882. 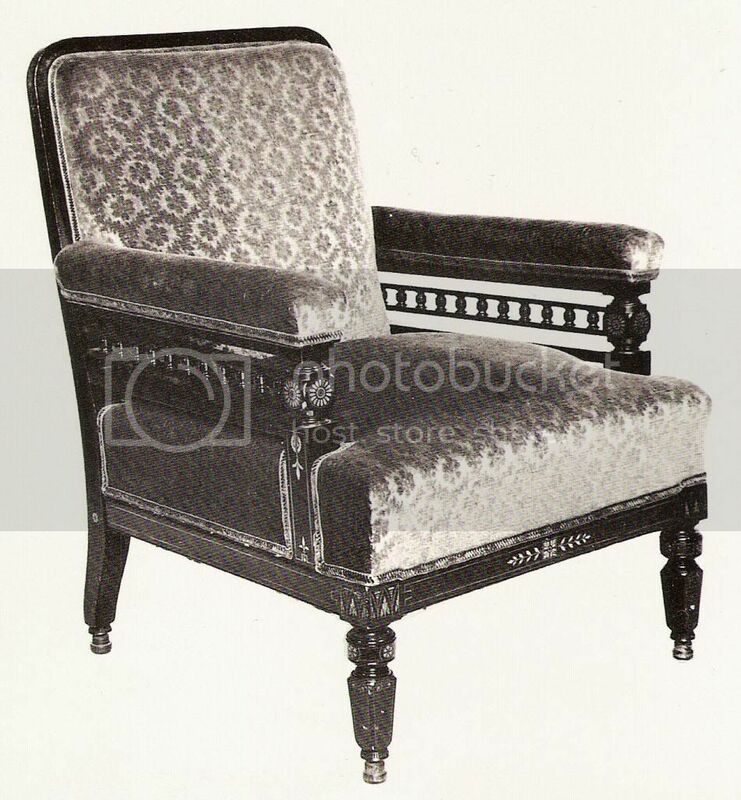 This first one is in “Eastlake-Influenced American furniture 1870-1890” It states that it’s one of a pair thought to be listed in an 1894 inventory of Jay Gould’s furnishings at Lyndhurst.. in the manner of Herter Bros., who made other furniture for Jay Gould. We have a possible Herter attribution on this one. This second one is from The Metropolitan Museum of art “American Wing” book and it’s by Pottier and Stymus. It was a gift of Auguste Pottier so the attribution is about as good as one can get. I can draw no conclusions at all, these type chairs were made by many manufacturers and the floral design was a popular motif on eastlake / aesthetic furniture. The suite in question appears to be identical to one pictured in “Artistic Houses” (published 1883-84 and reprinted as “The Opulent Interiors of the Gilded Age”); the illustration in question is #75 in the reprint. Stafford White, no way. As already said it is much earlier. Herter Brothers did finer work than this. Whoever owns this set is furtunate indeed, for the set was in fact made by Herter Brothers ca 1874-1878, is clearly in the Aesthetic taste, and has all the hallmarks of good quality and innovative craftsmanship, which clearly Herter Brothes was known for. It does indeed look like the same set as MLB points out from the Dickerson house. I would expect to see more fancy schmantzee from Herter Bros., although I have also seen signed/ labeled Herter furniture that was simpler too. ie: This bed for sale by Lise Bohm http://tinyurl.com/ddc8bx . 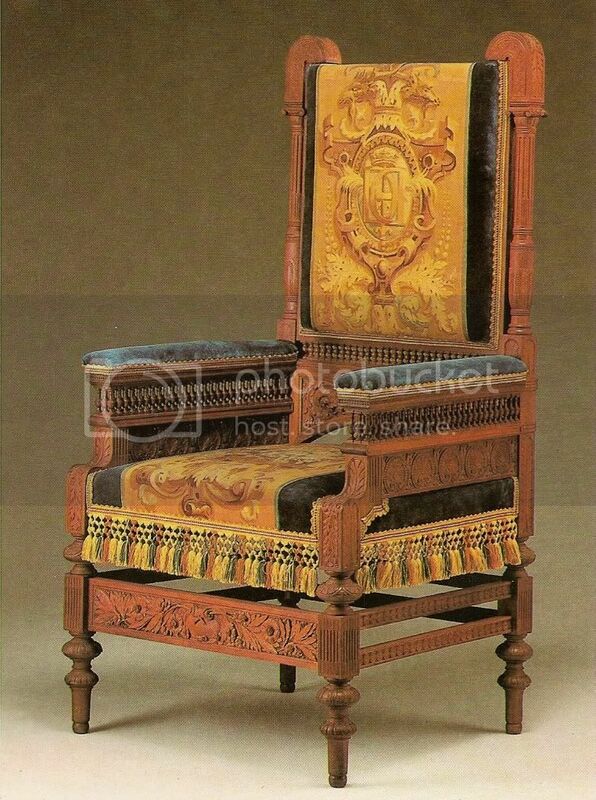 Here is a somewhat similar set stamped M and H Schrenkeisen, NY, 1876 – http://www.liveauctioneers.com/item/1688236 , also here is a similar chair & footstool attributed to P&S http://www.liveauctioneers.com/item/1837098 . John, Please thank all of your interested parties who responded to your posting of the set. It was wonderful to learn so much information and I do believe it to be the same as in the 1536 picture. I second the Herter attribution. For me, it was the brass conical caster rings that did it. I haven’t seen those on other makers. They are impossible to find. And do something about the upholstery and uphostery job! That needs a hand-tied edge roll and a decent woven period fabric. mlb, thanks for the detailed info and Dickerson photos. I think we have a match. Zeke, thanks for sharing the glow of your scanner with us. We appreciate it. I have more information on the tie-in to White for a subsequent post. I find it curious that everyone agrees it not to be designed by White, yet I find it odd that the name has been carried along with the set for almost 100 years (not a recent attribution). There must be some link to the name somehow. What I haven’t seen above and through my own investigation is a conclusive link to Herter, either through matching carvings, or a brand somewhere. Makes me want to tear the upholstery off to see what’s inside. Seems certain to be a NY set. Ginny, thanks for sharing it with us. WOW, lots of comments on this post, nothing like a good mystery to get the posters fired up. White? i have no clue but its not out the realm of possibility, white was a renowned ladies man who could have designed furnishings for one of the many houses he did for the rich & richer. LOL @ “tear the upholstery off to see whats inside”, not a bad idea actually. What’s the old saying, “Oral history isn’t worth the paper it’s written on”? I’ll be looking forward to the further information on the Stanny White connection. Correcting my correction: The date of “the late 1870s” is accurate, as decoration of the house and room was complete by September 1879. Just wanted to thank you personally for your diligence and investigative work in finding a chair like ours in a picture of so long ago. It was a thrill to have it documented even though the maker is undetermined. It was unfortunate the invoice from when my grandparents purchased it did not make it down the line. My grandmother said they paid $1,000.00 for it in 1911 in a letter she wrote in the early 60’s to my Dad. Thank you again and have a wonderful Easter. Perhaps I need to re-tune my eyes, but am I the only one that would have passed on this set at an auction? I’m not trying to be negative, but I find a Herter (or other high-end maker) attribution somewhat surprising, as the carving quality seems sub-par. Maybe it is just the picture quality. Regardless, the sleuthing at RV is highly educational! The information gathered here comes from the internet and a few books (both subject to errors, books less so). The only primary source consulted was Certain New York Houses (Harpers 1882) which does not illuminate much. With the possible association of this furniture with the Edward N. Dickerson drawing room, certain aspects of William B. Bigelow’s career are of tangential interest. William B. Bigelow was born in Massachusetts in 1852 and attended MIT. Bigelow and McKim had been classmates at the Ecole des Beaux-Arts and together they formed a partnership with Mead in 1878 (other sources suggest 1876). Wikipedia states that McKim and Mead joined forces in 1872. The firm completed the Dickerson house in 1879. Bigelow also left the firm in 1879 (possibly because his sister’s marriage to Mead had ended in divorce) and was replaced by Stanford White. What of Bigelow’s career after his stint with McKim, Mead and Bigelow? Some sources describe him as ‘retiring’ from McKim, Mead and Bigelow. True, he left the firm, but at age 27 he could hardly have been in a position to retire. He continued to work in the field and had a long career: Treasurer for the Metropolitan Art Club (organized 1893), Central Methodist Episcopal Church New York City (AABN 1898), and member of the AIA (1901 – 1903). Bigelow died in 1917. More importantly, Bigelow appears to have had a strong connection to Herter Brothers and Christian Herter himself. William Bigelow was involved in the decoration of the drawing room in the Mary Stuart house, New York City (started in 1881 and completed in 1883) via his employment with Herter Brothers. Sometime during the period when Herter Brothers was working on the Vanderbilt residence, William B. Bigelow joined the staff as head of the design department. Bigelow came to Herter Brothers from the architecture firm McKim, Mead & Bigelow. When Bigelow’s sister Annie and his partner Charles McKim were divorced in 1878, he left the young architecture firm for Herter Brothers. Note: As for Christian Herter’s retirement, after completing plans for the Wm. H. Vanderbilt commission in 1879 he states, “I am just retiring from active life, and I only accept the contract with the understanding that it will be my last one.” The Vanderbilt residence would not be completed until 1882. Prophetically, it was Christian Herter’s last great work. He enjoyed little of his retirement, dying in 1883. I do not know if Bigelow continued his association with Herter Brothers after Christian’s death. McKim and White met in 1872 in H. H. Richardson’s office in New York. McKim worked with Richardson from 1870 to 1872, when he left to form a loose partnership with Mead, also in New York, that William Bigelow joined soon after. White came to Richardson’s firm in 1872. In 1878 White left for a year of travel in Europe. When he returned in 1879 the firm of McKim, Mead and White was established.